I’ve previously written about creating a framework for marketing around a very basic customer journey containing four phases – see, think do and care which is a very basic but very useful in terms of planning marketing and communication focusing on the path to purchase. Open customer journeys on the other hand, are a more in depth look at specific customer segments actual journey pre and post purchase. So what do I mean with an open customer journey? With an open customer journey I want to emphasise the actual process (outside your company context) that your customer goes through before buying a product or service that you sell. This can and should include before and after a purchase. When designing a new online presence (or other initiatives as well), this process is usually mapped out by a user experience designer after both research, interviews and other inight work to really understand what the customers go through before deciding to purchase a specific product or service and to help you stand out by catering for their needs in every touch point. 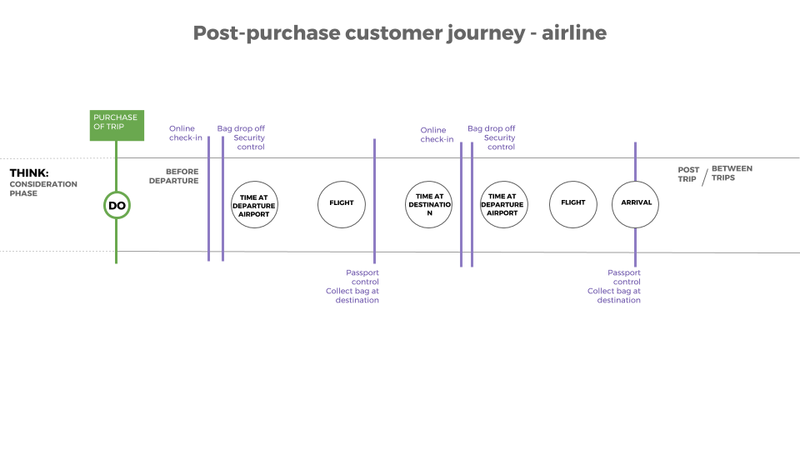 To better illustrate this, I’ve created one very basic customer journey for an airline company in this image above. Each target group of customers will have a slightly different customer journey of course. In this case a leisure travel customer and a business travel customer will have two similar but different journeys. In the image above, There are “six main events” for the customer in the big circles, which will take most of the customers time. Then we have the purple lines which indicates other important check-points. This is the customers context and what I mena with an open customer journey. There are plenty of opportunities here, post-purchase, to design a better experience with an airline company. That however, is it’s very own article.